The bombs that fell on the city damaged all types of building. Teresa remembers what happened to her when she was a little girl living in the world-famous Royal Crescent. At the time of the Baedeker raids Teresa was seven years old , the daughter of a scientist at the Admiralty, and was living with her family at Number 18 Royal Crescent. Life was quite tranquil for the first part of the war and I used to sit with my feet on the parapet outside the pillared first floor windows of our lounge. This was a beautiful large room running the length of the four windows of the house with a marble Adam fireplace at one end carved with every fruit imaginable. The central light had a beautiful carved Georgian surround and the door to the room had a facetted crystal door knob, key cover and finger plate which reflected the colours of the rainbow when a shaft of sun shone on it. Frequently the siren would go and we would see the black German bombers flying in formation over the hills from the south towards us and on to bomb Bristol. At night we had to close the inner shutters and not show a chink of light outside otherwise an Air Raid Warden would ring the bell and tell us to black out the window more. On the night of April 25th 1942 I was put to bed in the back room which was the same size as the lounge and looking out over the back garden. I was woken at about 11pm by a lot of noise and the bedroom curtains were blowing flat on the ceiling above my head. The blast had broken the window and glass was everywhere. Luckily it had missed me. My parents carried my sister and me downstairs and into the back garden and into the Anderson shelter under the lawn. This was cold. Water was dripping down the walls and spiders were lurking in the corners in their webs. There were a couple of wooden slatted seats around the edge and three families from the house squashed inside. We heard the bombs and planes above, but mercifully nothing hit the garden. It was a clear moonlit night but not too cold. We had managed to put on our outdoor coats over our nightdresses. Sometime passed and eventually the All Clear went and we returned to our beds and slept until morning. The following night, April 26th, the sirens went again and this time we all decided to stay in the house and we went down the stone stairs into the basement. In the Royal Crescent the basement consisted of two kitchens, a solid stone wine cellar approximately 10 feet square, a passage to the front of the building and a room to the side. We all huddled together in the space at the bottom of the stairs near the central skylight over the stairwell four floors above. Our placing in this particular area saved our lives as we were all sitting around the sidewalls the centre being empty. Suddenly there was a shattering bang and the whole of the ceiling and floor above came down on top of us but mainly falling in the centre of the space. We were choked with dust but we had our gas masks with us and hastily put them on. Mine was a fluorescent green and looked like Mickey Mouse. Some time later we saw torches shining through the wrecked passage and wardens shouting to ask if we were all right. They informed us that we had to get out as next door - Number 17 - had been hit by an incendiary bomb and was on fire. They crawled in and pulled us out one by one and I remember walking on one side of the bomb crater which was full of water from broken water mains. The front door was effectively a window as the bomb had blasted away the main pathway by the sunken area. We were helped out on to the cobbled road, homeless on a clear moonlit night and only in our nightclothes. A kind lady offered my sister aged five a wheelbarrow as she had no shoes and we walked through the gate into the field in front of the Crescent down to the lower section which was allotments and into Victoria Park. The sky was bright red with the mass of fires all over Bath. I was distressed because my favourite doll had been left in the cupboard in the bedroom and it looked as if the house was on fire. We walked into Victoria Park and made our way westwards towards Weston where a kind old lady took pity on us and offered us a bed for the night. My sister and I were tucked up into a large four poster bed and thankfully fell asleep. The next morning my father went back to see if we had any home left and found that next door had been burnt to the ground but the wardens had managed to get out safely the two old ladies who lived there. Number 2 Royal Crescent had been hit and Harley Street and Julian Road behind were virtually flattened. The German bombers had been aiming for the Royal Crescent but had slightly misjudged the distance and hit the road behind instead. Only one bomb hit the Crescent itself - on our house. Although extensively damaged the house was repairable and my father managed to get in and get essential clothing etc. We lost everything that had been in the lower passage and front basement room including our brown pram, which had been with us since babyhood. We were then evacuated to Frome and lived with a Mr. and Mrs. Board where my mother taught local children and us our schooling in the back bedroom. 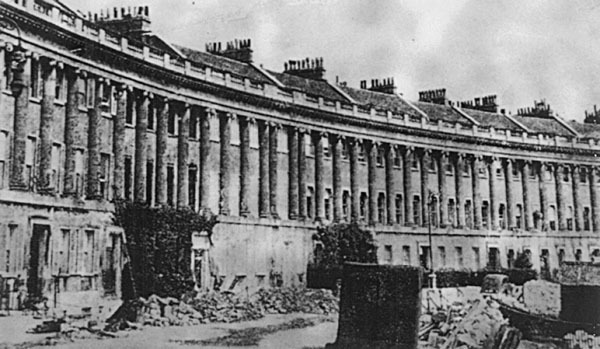 In this picture of the Royal Crescent, Number 17, which caught fire, is the one towards the left with the ivy growing up the front and no roof. Teresa's house was the one to the left of it, with its lower windows boarded up. In Teresa's story, she says that a bomb landed on her house. Strictly speaking, the bomb landed just in front of the house. She also says that Number 17 had been "burnt to the ground". It had indeed been gutted by fire, but the structure of the building remained. This can be clearly seen in the picture at the end of the Royal Crescent photos section.